Now, I’m in a much different situation. Having freelanced full-time since January, I begin to notice how demanding it is to grow a business and to make a living from it. Lately I’ve noticed how I need to gear up and give this my everything in order to make it fly. This podcast episode reminded me of a mind-set that I think is paramount for succeeding in doing this kind of work. This doesn’t mean to do everything perfectly. That won’t take you anywhere. Getting your content out there, consistently, is much more important than perfection (I have to remind myself of this all the time…). Rather, going the extra mile means to give your project that little extra time, energy and effort. To spend an hour in the evening working on it. To take the courage and email that person you admire and suggest a meet-up. To make a point of answering all the comments and emails you get from readers. To always be supportive, helpful and available in relevant forums or business networks (hi Elin!). 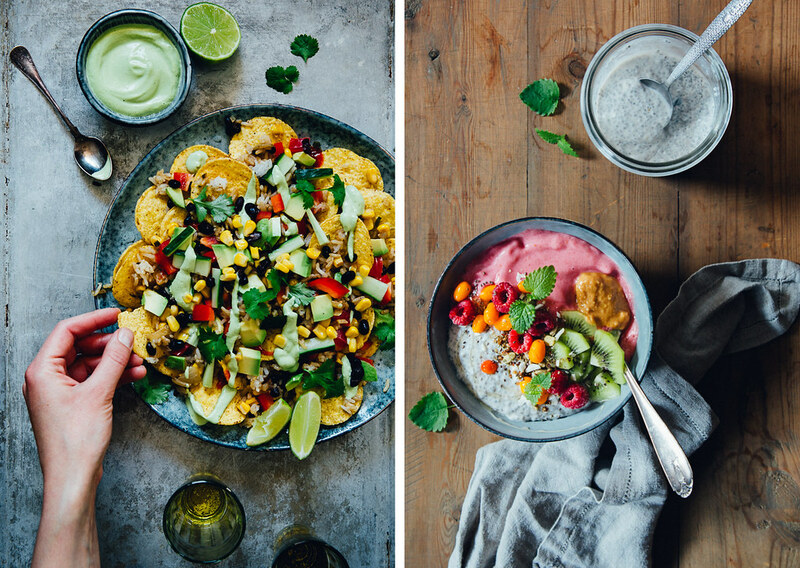 April was the month when I got obsessed with 50/50 smoothie chia bowls. Above is a raspberry banana kind and one with sea buckthorn & mango. I also made a messy platter of Mexican Fried Rice Nachos with all the toppings, from the One Part Plant cookbook. It can be about generosity. To not get so stuck in the creating that I forget to lift my gaze and connect with you guys and connect with colleagues. To be visible, available, helpful and generous will bring you much further than fine-tuning on your secret project to perfection. For someone else, going the extra mile might mean to dare create something that feels daunting, difficult or even impossible because no one has ever done it like that before. Or to spend three night a week after work creating your thing, so that you in 4 or 6 months from now can launch it. Whenever you feel like ”this is something I know I should do, because it will make my project better/my business more financially viable/my readers happier/myself more excited” – DO IT! Even though it feels overwhelming. Even if you just wanna procrastinate or hide in a comfortable and familiar work routine because it’s easier. We all feel like that. 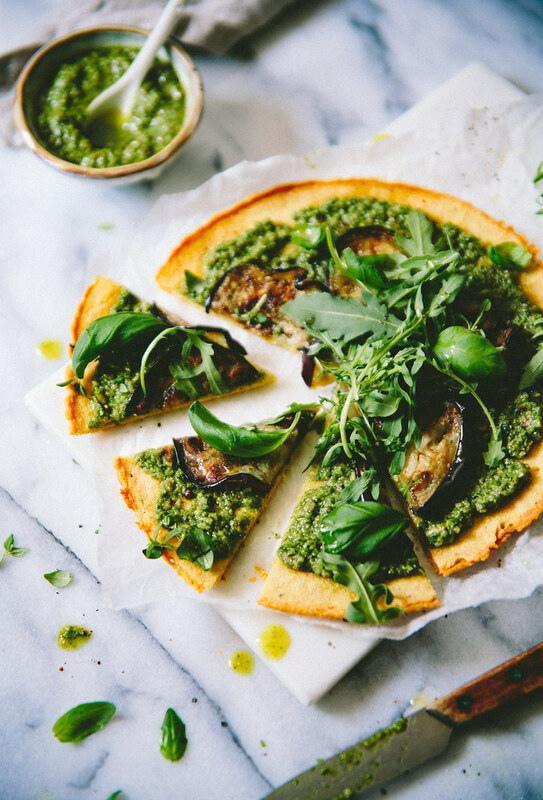 My Socca Pizza with vegan sunflower pesto quickly became an all time favorite over here. If you haven’t tried it yet – seriously go make it now! People who do go the extra mile are not fundamentally different people with an out-of-this-world drive that you will never get. They have the same amount of hours each day and the same responsibilities as you do. They probably even share many of your weaknesses. But they’ve made some priorities in life that has enabled them to live their dream and see their projects come to life successfully. It might be small things like waking up an hour earlier to make use of those precious morning hours. Or quit one of the 7 tv shows they’re watching simultaneously. Or unplug from social media while working on something important. I promise you that those little choices will make all the difference. The past week it’s been such. a. struggle. for me to even get out of bed and work at all. I’ve been tired and PMS-y and distracted by my messy and half-finished apartment and not at all fit for fight. 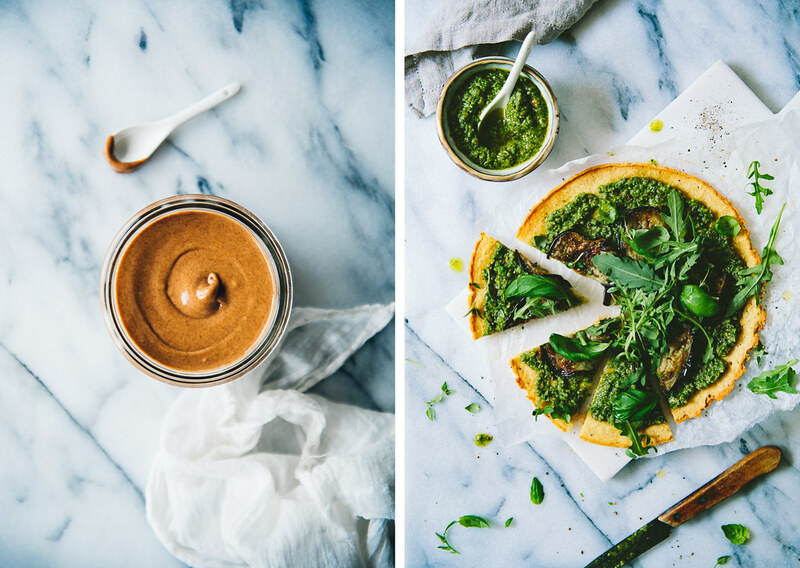 Though I did have a recipe I was pretty excited to shoot (the socca pizza). So even though I was dead tired on Sunday evening, I went out to get the ingredients so that I would be prepared for Monday morning. And to my surprise it all turned out so good! 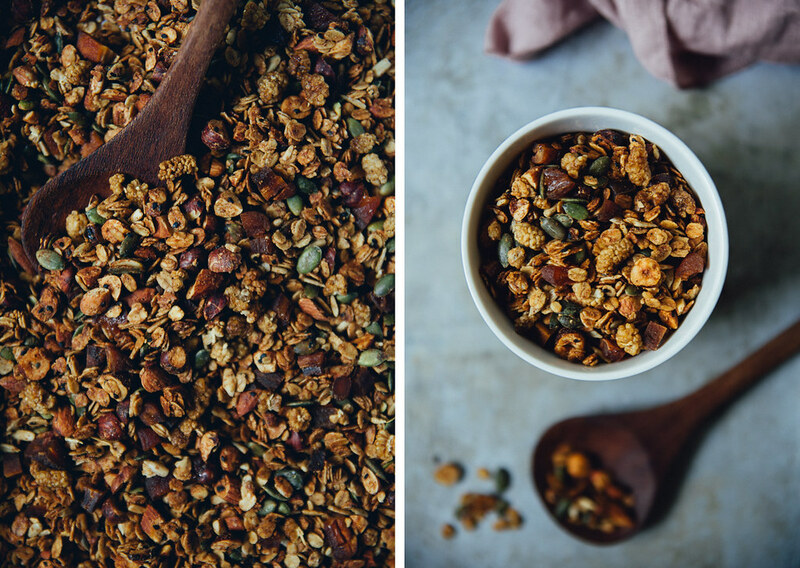 I was really happy with both the final recipe, the styling and the photographs. This brought me into a positive feedback loop that in turn generated even more energy for me to continue creating. To get things moving is the only way to get out of a phase of low motivation. I’m convinced it doesn’t work to just wait around for inspiration to come to you. When you are standing still, jumping over an obstacle is really hard. You gotta have a lot of leg muscles for that. But when you are already in motion you’re jumping over fences by sheer speed! 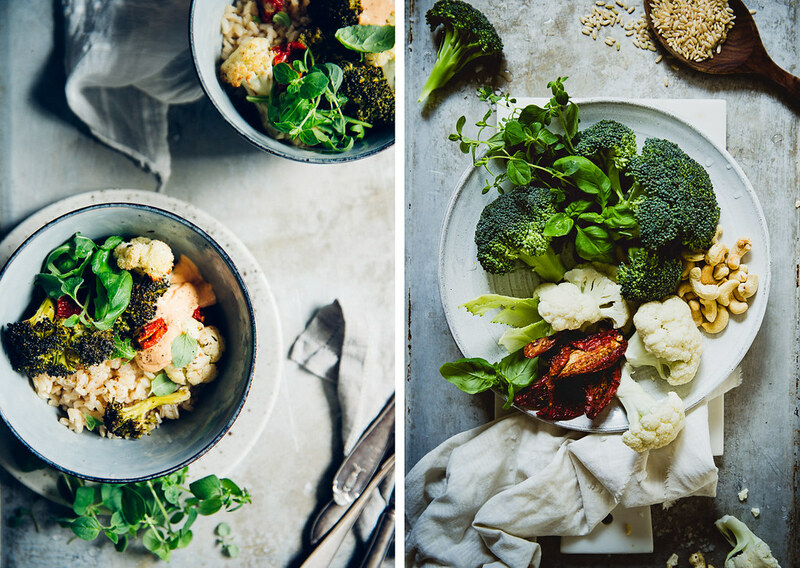 The roasted broccoli & sun-dried tomato rice bowls with cashew tomato sauce was super popular among you guys. And I get it, it’s the ultimate comfort food! Bring your idea out of your head and into the world. Talk with a friend about your idea, start an instagram account where you share you first sketch/process shot, write your idea down or do anything that will bring your idea from out of your head and into the world. It is way too safe in your mind. But if you involve other people, you get just enough of that pressure (and hopefully pep talks!) to continue pursuing it. Take baby steps. They are better than no steps at all. If your project feels huge and overwhelming, break it down into smaller to-dos and begin crossing them off. This will set you in motion and keep you in a flow of creating and moving towards your goals! Focus on consistency rather than perfection. Have fixed days for blog updates or other deadlines and focus on meeting those deadline. I always prioritize to create the recipe of the week and the instagram posts of the week before I do anything else. These tasks I do first-thing in the morning, and they are the first things I write in my calendar before filling up with other tasks or meetings. Do a reality check. Before you spiral down into that dark place of comparison over your work and your idol’s work, take a moment to remind yourself that you are just starting out, and that person has probably been in the game for 5, 7, 10 years. If it’s a blogger, scroll waaay back to their first blog posts and behold! They were also once total noobs that had no idea what they were doing. We all go through the same process. Try and see your idol’s work as your long-term goal, and use it to fuel your motivation to work hard so that you one day can get there. 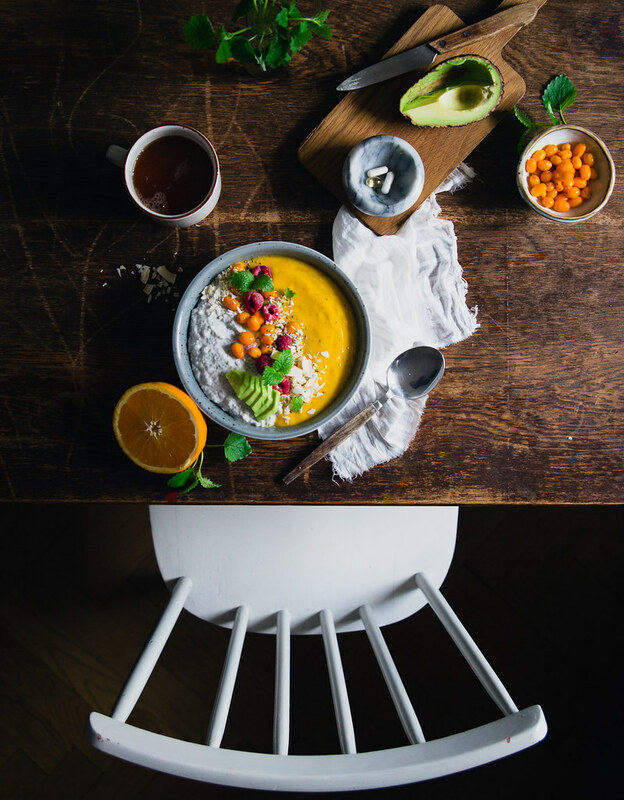 If you wanna do a reality check with me, check out these horribly shot recipes I posted during my first months of blogging: Chocolate Breakfast Loaf, Rosehip Smoothie Bowl, Butternut Squash Soup & Pumpkin Cake. Then consider I had already been blogging one year at another place before this… Imagine THOSE photos. Connect with your community. This might be the most important of all these points. If there’s anything that instantly makes me itch to create or crunch numbers or initiate new projects, it is to meet fellow bloggers/photographers/creators. It always brings something fresh to the table. A piece of valuable advice, a perspective you haven’t though of before, an awesome idea for a collaboration or simply that radiant energy and drive that many creative entrepreneurs have. It’s contagious!Join relevant online forums, Facebook groups and mastermind groups within your niche. If you’re leaning towards the extraverted side or are a people oriented introvert like myself – go to press events and coffee dates and seminars and blog events every now and then. It takes time from your production, but it’s going to fuel you to do more and to do better. What does going the extra mile mean to you? Tell me about it in the comments! Every month (or sometimes every second, if we’re gonna be honest) I share my favorite recipes, blog posts, articles, movies or whatever stuff I’ve been crushing on during the past month. Feel free to share your favorite links in the comments! I don’t remember if I already shared this, but a couple of weeks ago Louise of Oh So Sensitive interviewed me about being highly sensitive. We talked about if and when I first realized I was different, what strengths my high sensitivity has brought to my work and how I’ve struggled with coming to terms with the interplay between my one the one hand introversion and sensitivity and on the other side my fundamental need for social, human connection and healthy challenges. You can read the interview here. Whenever I’ve fallen out of my wholesome eating habits and meal prepping routines, Sarah Britton has the ability to get me 100% excited about it again. Every time I read one of her posts, I immediately reach for my sprouting jar and start soaking stuff. This post is no exception. Another wholesome foodie queen that always makes my mouth water and my bones ache for her lifestyle is Renee of Will Frolic For Food. Her barbecue eggplant & noodle bowl with golden beet sauce is everything I want for a cosy weeknight home. Last week Renee also wrote a very substantial post on self-care, with no less than 43 suggestions for soothing activities, and it landed in my lap just when I needed it. I’m gonna come back to this post many times. I truly admire her completely relaxed attitude towards whole foods and self-care. You can tell she has found what works for her, and she doesn’t care if that makes her a total hippie (I mean, in this community we all strive towards is being our most hippie-dippy, free-spirited selves, right? ;-). If I had to pick one tip and take to my heart, it would be ”Wake up earlier than everyone else to take in the peacefulness of morning quiet”. Getting an early start and being ahead of the day is so important for me in order to not succumb to stress and my busy schedule. While on the subject of TV, here in the north, the new (and last!) season of SKAM just aired. And again, I am blown away by how authentic, smart, funny and ground-breaking this show is. It’s everything I wish I had (and knew) when I was 16. Martha went to New Zealand with her toddler Mia, and it looked beyond amazing. I also wanna rent a camper van and travel through NZ, right. now! Sofia aka Mokkasin always posts the dreamiest weekend diaries. The stories she tells are in almost perfect synchronicity with how I imagine my own future life. Full of everyday magic and creative adventures with my family. Cosy breakfast hangs and flee market explorations. A partner with equal drive and creativity as my own. Sofia’s weekend diaries reminds me of my goals and my dreams, and for that I am grateful. Valentina of The Blue Bride posted a recipe for a dark chocolate miso bar?!?! I am SO intrigued by combining cacao & miso, HAVE to try it! Krickelin’s blog post on creating a business based on the life you wanna live was insanely inspiring to me! Her web shop For Good Luck with sustainably produced clothing and gems from all over the world is probably my favorite shop ever. I love the photo stories from their production trips, and I could adopt every single one of Mir’s tattoos. They’ve truly succeeded in creating a compelling story around their brand. Like this post? Hit the heart-button at the top or bottom of the post! That way I know which content you love and wanna see more of :-) Thanks! Glad you like it! :D Yeeess watch it!! Now and then there’s a piece of wisdom that ”lands” in front of me when I need it the most. This is what has happened today with your post. Focus on consistency rather than perfection is something I need to remind myself so often. Also to go out there and connect is a very good piece of advice. It’s so easy to stay confortably behind the computer screen, specially when you’re somewhat of an introvert ;) Have a lovely week! Been meaning to comment on this for a few days. Read it on instagram and it struck a cord. I feel we’ve been a very similar, yet different path. Similar because like you I’ve thrown myself head first into this whole blogging/photography/styling thing. Similar because we started at the same time(ish) and similar because I too had a buffer zone (AKA savings and a husband) which made it possible. Different because of course your path is your own as is your style and photography. But I can relate to soooo much you are saying. Thanks for sharing these encouraging and inspiring word. Jag har äntligen fått koncentrationen tillbaka efter ryggskottet och det första jag längtade efter var att läsa detta inlägg. Så mycket fina kloka tankar och jag tar det verkligen till mig. <3 Jag tycker att det är så svårt att veta ibland om jag skyller på min utmattning och värk eller om jag bara inte vågar tro på mig själv. Det blandas så lätt ihop i min värld tills jag inte vet vad som är vad. Men så har jag kanske höga krav på mig själv också så jag kan ju börja med att bara tro på det jag gör ;) Sen alltså gud vad jag skrattade när jag läste om att säga saker högt och visa upp idéer för det är något jag verkligen inte ska göra. Min hjärna funkar så att om jag pratar om något så tror den att jag har gjort det och jag tappar hela motivationen till att genomföra det. Så många bra idéer som jag bara har pratat bort. Inte så kul att vara en strateg ibland. Åh vad jag gillar dina inlägg. De är så välskrivna och jordnära. Tack för att du gör din grej. Such an inspiring post. Thank Agnes! oh i just love everything about this post! you’re such a deep, inspiring person Agnes.